The first Seven was built in 1957 by Lotus, the brainchild of Colin Chapman, who was convinced of the advantages of small lightweight racing cars, giving huge power to weight benefits. He actually referred to the Seven as something he had dreamed of designing since he was a schoolboy - a 'four wheeled motorbike'. The Lotus Seven began as an uprated version of the successful Lotus Mark 6. Steel tube frame with aluminum bodywork, later with glass-fiber nose and fenders. 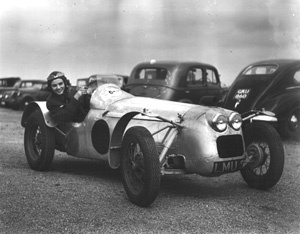 The first sevens were priced at £587 and were powered by a 40bhp Ford engine coupled to a single dry plate clutch and a three speed Ford gearbox. The design proved to be an instant success, Graham Hill being the first driver to race the seven in 1958. Over the next decade there were three more series of the Seven developed, improving transmission, suspension and increasing power to 84bhp. A variety of engines were used. Low, light, very quick, incredible handling and a winner of enumerable club races. Lotus discontinued production after the introduction of the Glass-Fiber steel backbone framed Series 4. 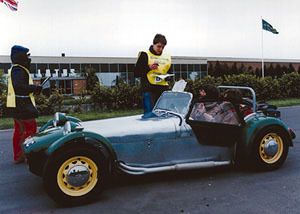 In 1967 Caterham Cars became the sole distributor, and have continually developed and improved the car since. Major developments over the years have included the introduction of double wishbone front and de Dion rear suspension, four wheel disc brakes, a six speed close ration gear box, a torsionally stiffer spaceframe chassis with honeycomb panels for side impact protection and lead free engines with catalytic converters. In 1976 the R.A.C. banned the seven from racing, as they said it was "too fast" - so special categories were developed. See this link to the official Colin Chapman Museum and Education Centre website.